I watched SPC and models for days and know we could have severe thunderstorms outbreaks in the area with possible tornado. I decided to chase when my area got tornado watch and I had to go out early to catch some cells. I decided to go south on hwy 63 for awhile. I did catch some nice shelf cloud and very heavy gust wind and heavy rain. After the shelf cloud passed me. after those storms passed me. I drove toward hwy 14 to chase east because there are more cells coming toward to that hwy 14. few of them got tornado warned. I wanted to catch a tornado! as I drive... on hwy 14 near some cities. I saw some tornadic cell and watching radar on my phone. 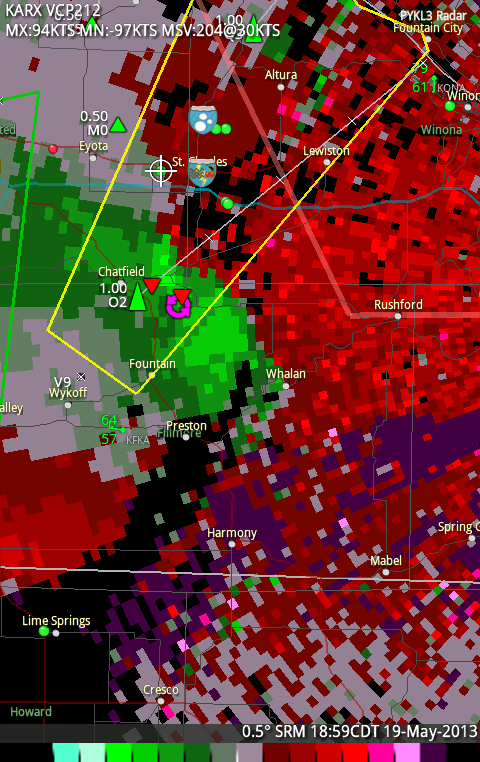 I am seeing some strong rotations on radar and it should be tor warned! I know NWS are usually slow with tornado warning rotations. There was TVS (Tornado Vortex Signature) on my radar! upside down red triangle on my radar is TVS. I decided to drive foward and I saw so much fog and heavy wind. It look like the ground was smoking! very similar thing happened as tornado was developing. I seen this similar smoking from ground in other storm chaser's videos. 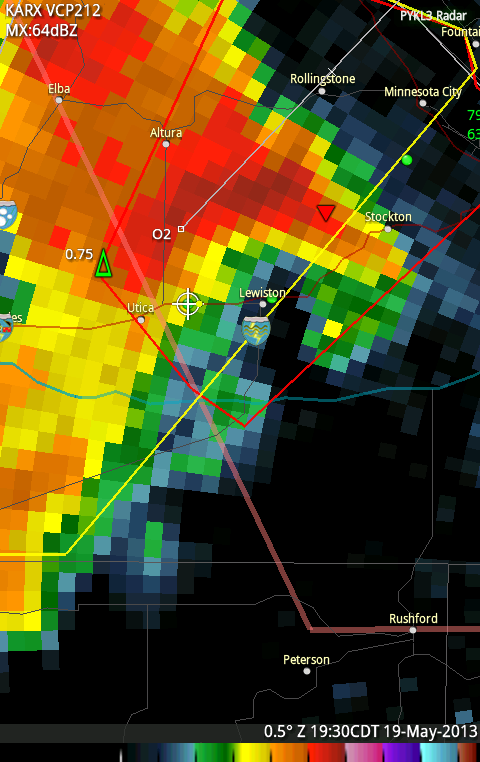 you also can see that there is hook echo NE of me. as storm passed. I drive down hwy 14 and made right turn to some gravel road down the path of tor warning to see if there was any serious damage from this cell. only I saw is some roofing materials? black debris on road and broken off tree. I drove back to home... watching beautiful lightning. great for photographers who love to take pics of lightning. next day, Someone told me on youtube that the storms I chased was mentioned on TWC. Few weeks later and after few storm chases.... GUESS WHAT?!?!?? 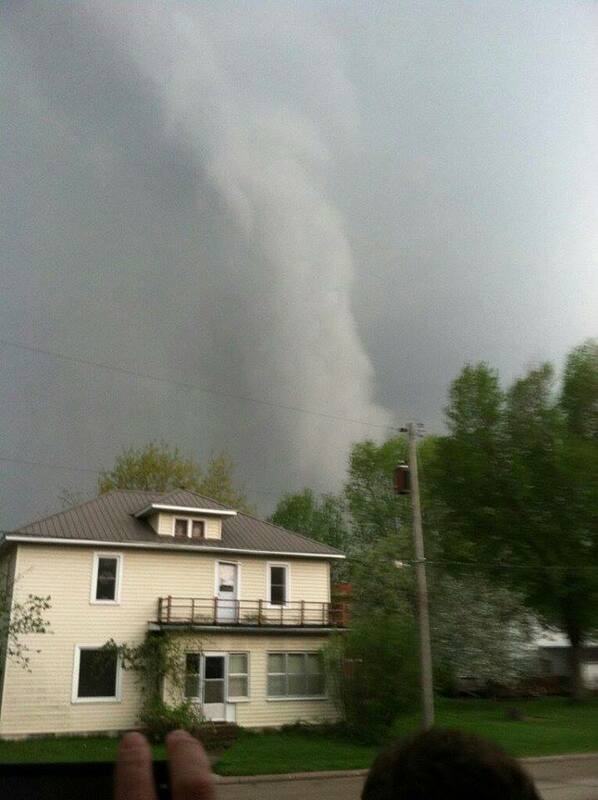 I saw a picture of funnel in the area very close to lewiston.... someone took picture of the funnel. I must be under there because of amount of fog I saw. I went on SPC and looked up storm reports... NO TORNADO REPORT in this area! I guess NWS do not bother going over this area and verify if there were tornado was really there.